The Burj Khalifa, currently the tallest tower in the world, officially opened in Dubai on Jan. 4 amid an impressive pyrotechnics display that highlighted the tower’s 2716.5-feet of aluminum and steel, and its 26,000 hand-cut glass panels. The Burj Khalifa blows away the next-nearest skyscraper, which is China’s 1670-foot Taipei 101, and the building has even surpassed ultra-tall, ground-cable-supported radio antennas. Architects’ vertical leapfrogging, however, isn’t likely to stop at the Burj Khalifa. While the tower will be a tough one to beat, it is likely to remain at the pinnacle for only about another half-dozen years. Developers around the world have proposed numerous new skyscrapers. Some projects have leapt off the drawing boards, though plans for many record-breaking towers have been scuttled because of the global economic spasms of the past couple years. So what buildings could be the next to rise up and steal the Burj Khalifa’s crown? Here are eight future contenders. This mammoth structure will rise to exactly 3284 feet, or 1001 meters. The height, in meters, is an allusion to the classic collection of Middle Eastern and South Asian folk tales One Thousand and One Arabian Nights, says London-based architect Eric Kuhne, whose firm designed the tower. To break the kilometer-high mark (which is 3281 feet), the $7 billion–plus Mubarak al Kabir will have three interlocked towers that support the overall structure. These towers, or “blades,” pinwheel about a triangular central shaft that holds elevators and mechanical equipment. Each blade twists 45 degrees as it rises, for strength, and expands slightly at the top. This Kuwaiti landmark will therefore place more mass and usable space near its zenith compared to other towers, says Kuhne, to avoid the structure having too thin and flexible a tip. To dissipate high-altitude, tower-buffeting gales that could blow at 150 miles per hour, the Mubarak al Kabir will see the first architectural deployment of vertical ailerons—the normally horizontal flaps airline passengers see on a plane’s trailing wing edge that help counter wind disturbances. “They will look like continuous ribbons running vertically along the six leading edges of the three blades,” Kuhne says. “As [the ailerons] are constantly moving, and catching the sun while they adjust, sunlight will glint off their surfaces. It will add a gentle rippling reflection to the edges of the blades that will add dynamic sparkle to the tower,” Kuhne says. 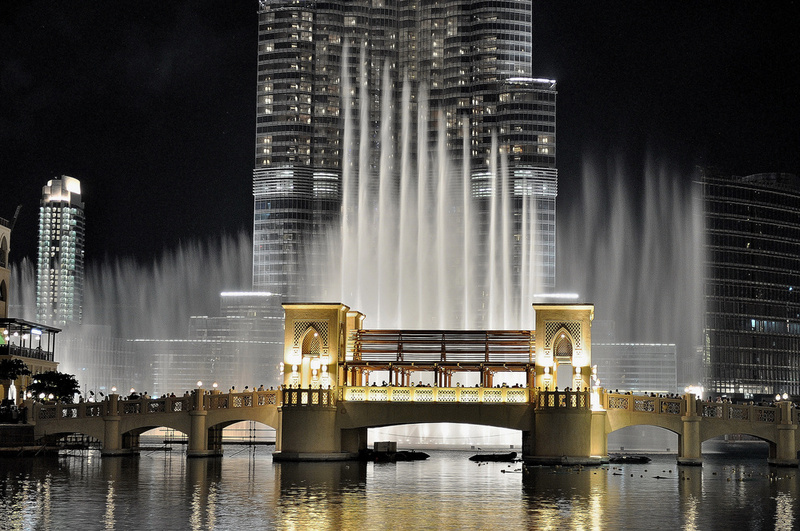 The Burj Mubarak has a projected completion date of 2016. Building higher also means building wider. That is why the 3280-foot 1 Dubai will be built with three towers. “What tends to happen is as these buildings get taller, the base needs to be wider, but it gets to the point that it’s just too wide to be a single building and you start to pull things apart or separate them,” says Peter Weismantle, director of supertall building technology at Adrian Smith and Gordon Gill Architecture. The smallest tower of 1 Dubai will come in at around 1970 feet and the tallest at about 3280. All three emerge from a tripedal base architects call the saddle. A canal will flow between 1 Dubai’s three legs, letting boats sail underneath. Further support for the towers comes from the connecting skybridges where tower residents will be able to congregate. Designers envision building the skybridges at the saddle and then using a jacking mechanism to hoist them into place. Clearing the site for the project began in 2008 but has since been put on hold thanks to the state of the world economy. If and when construction begins in earnest, 1 Dubai will take somewhere between seven and 10 years to complete. The 160-story Miapolis will rise nearly 3300 feet on Watson Island in Biscayne Bay, just west of Miami Beach and east of downtown Miami. The $22 billion Miapolis complex will host an indoor amusement park, luxury condos and apartments, office space, a performing arts center, and a marina. With Miapolis, planners hope to demonstrate the potential economic benefits of high-profile real estate: developers say it could bring in nearly a billion in annual tax revenue and pump over twice that into the local economy as visitors flock to South Florida’s newest attraction. For now, the project remains on the drawing board at architectural firm Kobi Karp, and there is no shortage of artist’s impressions of the many facets of Miapolis. The designers want the complex to be environmentally responsible and intend to have the building receive a LEED Platinum rating by the U.S. Green Buildings Council. Further information about Miapolis is scant for now as developers are tight-lipped about the project, though lead developer Guillermo Socarras says he will be announcing new details in a few weeks. Meanwhile, Socarras is in talks with the Federal Aviation Administration about getting clearance on Miapolis’ soaring height, given the proposed site’s proximity to Miami International Airport. This cylindrical megatower has eight spires that come to a point at the building’s peak. Though an official target height has not been revealed, the Nakheel Tower is likely to crest 3280 feet. Its designers, the international firm Woods Bagot, aim for the Nakheel Tower to be the first true realization of a vertical city. Over 15,000 people will live, work and socialize in this spire with a ground footprint the size of a New York City square block. The placement of support columns is based on a radially symmetrical 16-point star pattern and is inspired by Arabic patternmaking. The pattern makes engineering sense because a symmetrical building bears the load evenly among its structural units, according to a 2009 case study on the Nakheel Tower published in the journal of the Council on Tall Buildings and Urban Habitat. The trickiest part about designing the Nakheel Tower, according to the study, was dealing with so-called vortex shedding from winds, which can cause damaging vibrations. Instead of funneling wind around its metal and glass skin, the Nakheel Tower takes the uncommon approach of having large gaps in the midst of the building, with a double set of slots that let gales pass right through. Every 25 floors or so, big disk-like skybridges bind the towers together and serve as village squares for high-rise dwellers, as in 1 Dubai. Also as in 1 Dubai, the Nakheel Tower’s completion date has been held up because of unfavorable market conditions, though some early construction work did get underway before the stall. A completion date has not been announced and the project may never resume. The Takenake Corporation proposed Sky City 1000 back in 1989 to tackle Tokyo population-density problems. Tokyo-like congestion prompts a demand for green space and office space that vastly exceeds supply, and also introduces a host of environmental and social issues, from pollution to uncomfortably packed commuter trains. Takenake’s solution: Build up—way up—and place green spaces in the sky. “The feature of our proposal was making artificial land in the air,” says Masato Ujigawa, manager of the engineering department at Takenaka. To achieve this, Takenake will first start with a base that is 1300 feet per side, a footprint that equates to several city blocks (Burj Khalifa’s triangular footprint is just 300 feet or so). Then, in accordance with its name, Sky City 1000 will rise a full thousand meters (3281 feet), consisting of 14 levels stacked on top of one another. Each level will act as its own “town,” with a park-like plaza area in its center ringed by residences, schools and businesses. The structure would hold 10,000 homes and be used in some capacity by 130,000 people. Construction has not begun on Sky City 1000 since Japan’s population has begun shrinking as of 2005, Ujigawa says. Nevertheless, Ujigawa says that ideas originally espoused by the Sky City 1000 project have since been used in more conventional construction. These include concrete reinforced with carbon fibers instead of iron to cut down on weight, and self-contained water-service systems in buildings that treat sewage and reclaim water. The roughly $15 billion Bionic Tower will break from traditional engineering principles, introducing radical design elements for the 4029-foot-tall tower, according to Eloy Celaya, an architect with ECE Arquitecturas and one of three principal Spanish designers of the Bionic Tower. Instead of vertical foundations, Celaya envisions a “floating foundation” similar to a tree’s roots, with a tangle of many hundreds of anchors in the ground. For supportive, criscrossing trusses, the Bionic Tower will draw inspiration from bird bones, which are light and hollow. The twelve stacked neighborhoods within this vertical megalopolis will receive water, energy and other supplies by means of 92 vertical columns (much like the xylem and phloem transport systems in vascular plants), which will double as structural supports. Though the concept for the Bionic Tower was originally pitched to Shanghai, China about a decade ago, at present the prospects for this tower being erected someday are iffy.